Tetracycline, Oxytetracycline, Chlormycetin/Chlormaphenicol, Kanamycin, Furan compounds, Erythromycin (Maracyn)... Some are useful for treating (bacterial) "Finrot" (along with assuring, improving environmental conditions), as well as treating secondary infections. Quite a few can/do interrupt biological filtration. Do be testing for ammonia, nitrite if you employ these. I've learned so much from your website. Thank you for all that you do. I have a 4 year old fancy goldfish alone in an established 50 gallon tank. As you can see she is floating upside down and blood is pooling in her belly area- this is NOT due to injury or trauma- it started out as tiny pinpoints of blood that looked like a rash and has progressed over the past few days. The area that is red is the area that sticks up out of the water as she is floating (could be from drying out?). Her scales are not lifted, she has no intestinal blockages- I have been feeding a couple peas per day and they pass. She was upright a week ago- this is very sudden. I change 30% of the tank water twice a week. The photos do look similar but the bleeding in my fish is much more extensive. I have put Kanaplex in the water now since I have read that Kanamycin is one of the few antibiotics that can be absorbed through a fishes skin. 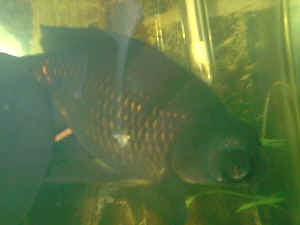 The fish is still hungry but I am afraid to feed her: can food make the infection worse or is it okay to give some vegetables? I can make some gel food with Kanaplex in it if this would help. I made some gel food last night using Kanaplex and the fish is eating (she is quite hungry, actually). Unfortunately when I tested my water this morning I am getting a reading of 10 ppm ammonia. I did a 50% water change but am still detecting ammonia which it is especially serious since the pH of my tank water is 9.05 (this is cutting my horrid tap water with 50% RO water). My tap water is pH 9.5 and even pure RO water still has a pH of 8 after going through the filters. I know I need to hit this infection with an appropriate dose of antibiotic but the stuff I added to the water is killing my good bacteria (even though the product is not supposed to do so, according to the rep). I chose Kanaplex because it can be mixed with food, is one of the few meds that is actually absorbed by the fish and it one of the best rated for very high alkalinity (and I happened to have several vials of it in case of emergency). What can I do to reduce the impact on my filter? How deadly is 5 to 10 ppm ammonia in a pH of 9.05? I hate to NOT add medication to the water if it gives the fish a better chance, but ammonia poisoning is just as lethal. I am treating the fish in her tank as she is too big for a hospital tank- I drained out quite a bit of the water for comfort for the fish (she was swirling all over the place trying to right herself) and to ensure that my oxygen levels in the tank stay nice and high during treatment. 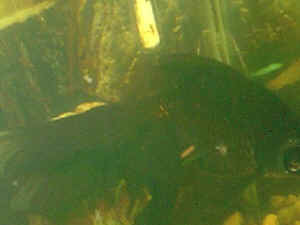 I have 25 gallons in the tank (about 5 inches of water) which keeps the fish much calmer than when it was full. called did not understand what I was asking when I called to find out how much Kanaplex I needed to treat a 340 gram fish. <I'd try the Seachem support forums and see if you can get a good answer that way in terms of dosing by fish weight or mass. Sorry for my long letter but the fish is still very interested in food and I am clinging to the slim hope that I may be able to save her. She was my very first goldfish and is infinitely precious to me so I am most grateful for your advice. for the bleeding in the stomach to disappear and about a week after that she was still upside down but at the bottom of the tank rather than the top. She has since flipped upright. 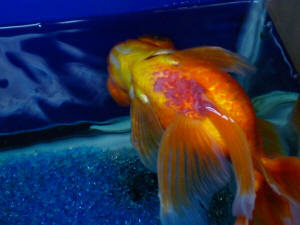 She is still lethargic but has very much improved- thank you so much for your help with this fish! <It's refreshing to see a tank not loaded to it's maximum capacity>. <Logical. 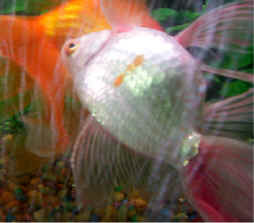 Goldfish aren't noted for fighting>.